We obtain many enzymes from microorganisms. The enzymes that are used in industry are usually obtained from microorganisms. These include bacteria and microscopic fungi, such as yeast. The microorganisms are grown inside large vessels called fermenters. Inside the fermenter, the microorganisms are provided with everything they need to grow and reproduce, e.g. :O2, supply of nutrients, a suitable pH and temperature. The microorganisms make the enzymes and release them into the liquid in which they are growing. The liquid can then be collected from the fermenter, and the enzymes purified before use. The fermenter is a large, sterile container with a stirrer, a pipe to add feedstock* (molasses* or corn-steep liquor), and air pipes to blow air into the mixture. The microorganisms are added and the liquid is maintained around 260C and a pH of 5-6. 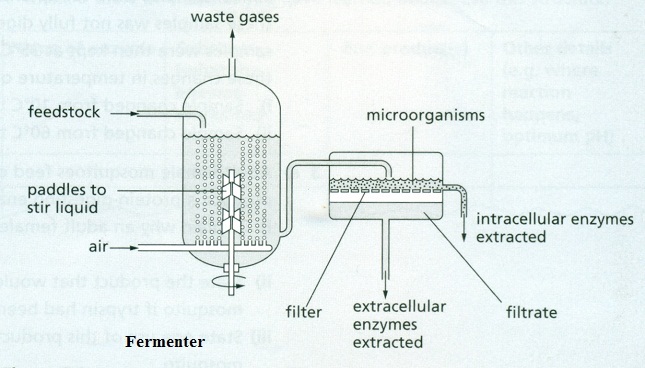 Extracellular enzymes are extracted from the feedstock by filtering. To extract intracellular enzymes the microorganisms are filtered from the feedstock, then crushed and washed with water. The enzymes are now in solution. * Feedstock: Raw material (input) fed into a process for conversion into something different (output). * Molasses (syrup): Thick, dark brown, uncrystallized juice obtained from raw sugar during the refining process. *Corn-steep liquor: a concentrated fluid obtained by soaking corn grains in water (containing 0,2% SO2) for 36 — 40 hours at 46 — 50°C.